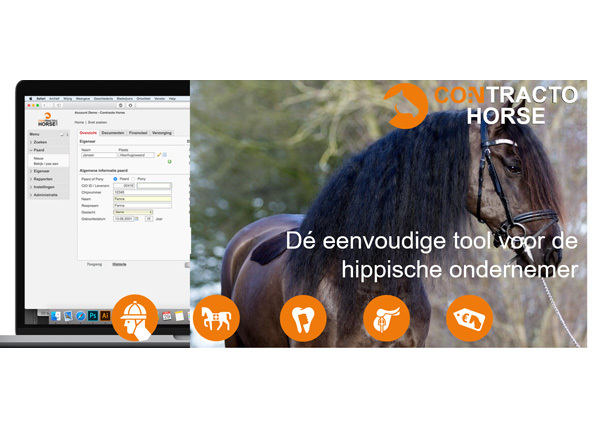 Contracto Horse is the simple software tool to support the customer process within different branches of the equestrian world. Several ‘environments’ have been created within the software for the Therapy (physio, osteopathy, cranio sacral) branches, Saddle (saddle fitters and suppliers), Stable (trade stalls, sports stables, stallion yards in connection with the mare administration), Sales (commissioners within – and abroad) and Dentist (dental care providers). Every environment has its own specific data and all data that is needed can be registered. Photos, videos and necessary documents are stored and kept in one file.